The Censor 1330 has an enhanced blade spine and tip for increased penetration. The Steel Will Censor knife could be a great option as a patrol or SWAT back-up self-defense knife. Steel Will has been continually impressing the market with innovative new designs, a high level of craftsmanship, and material selections to ensure the end product is durable, and the blade maintains a sharp edge even after heavy use. Steel Will knives have been rising in popularity due to the company’s insistence on manufacturing excellence and an end product that is both attractive and highly functional. The Censor, with its curved handle, aggressive grip texture, high quality blade, and window punch pommel, presents a highly functional duty knife. The Censor 1310 has a very nice spear point blade. The Censor was actually released by Steel Will in 2016, ahead of the 2017 SHOT Show, and I must confess I missed the announcement. Thankfully, Steel Will was presenting their newer knives at the Show and I was able to take a quick look at the Censor. I was impressed. The Censor 1312 has the black traction coating. Steel Will has developed the Censor under their “Urban Series” of knives. Though not specifically marketed towards law enforcement, the Censor has unique characteristics making it a very viable selection for police officers. The Censor could be a great self-defense knife for officers or civilians, whether on-duty of off-duty. In fact, Steel Will’s advertisement for the Censor subtly indicates the intended uses for this excellent knife, “this knife is a reliable partner for uninvited or difficult situations.” Well said indeed! The Censor 1322 has a Predatory variable grind blade, and the black traction blade coating. The Censor grip panels are made of nylon with a diamond-pattern texture. There are also four grooves on each side to provide additional grip traction, and a means to channel liquids. The Censor grip is curved in what Steel Will calls a “pistol grip.” The pommel has a pointed window break, that can double as a rearward striking point. The curved nylon grips of the Censor provide better thrusting traction. The advance of curved grips has been on the rise in the last few years. There are more self-defense knives and training moving towards a punch and slash technique that uses gross motor skills rather than the more highly skilled knife defense techniques that require fine motor skills. Some of the Steel Will knivesare very well made, but come with the high quality price tag as well. With the Censor, Steel Will has kept the price well within the affordable range for a wide audience of customers. At only $59.99 MSRP, I am already in the process of ordering a Censor for myself! The Censor 1330 enhances and narrows the tip for better penetration. The DOTS sheath has a multi-position belt clip that can be removed for flat attachment to packs. The injected molded nylon sheath for the Censor. Steel Will has been gaining in popularity with their excellent materials selections, and unique designs. The Censoris a self-defense knife purpose-built to help the user maintain control of the knife during high intensity confrontations. The AUS-8 stainless steel blade will resist corrosion and keep a sharp edge over long periods of time and exposure to the elements. I really like the curved grip of the Censor. 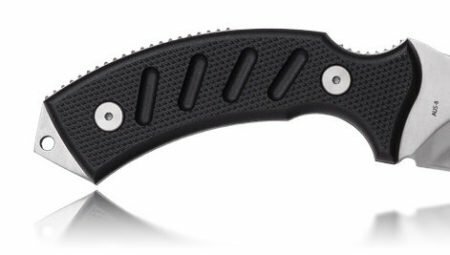 Traditional straight fixed blade knives can suffer in application during self-defense encounters due to the natural grip of the hand. By curving the handles the Censor provides the user a greater thrusting design that should be more maintainable during violent encounters. The highly textured nylon grips not only feel good, but provide very good grip traction. The glass break pommel gives the Censor multiple uses for first responders, and doubles as a rearward thrusting impact point. Overall I’m impressed with the Censor and look forward to receiving mine. The Censor knives are functional, attractive, and made with high quality craftsmanship and materials.